What if I told you that there is more to Goa than just meets the eye and an increasing number of discerning travellers are starting to realize just that. Imagine a place where you could spend some time with yourself, listen to your thoughts, rejuvenate or live carelessly like a local. 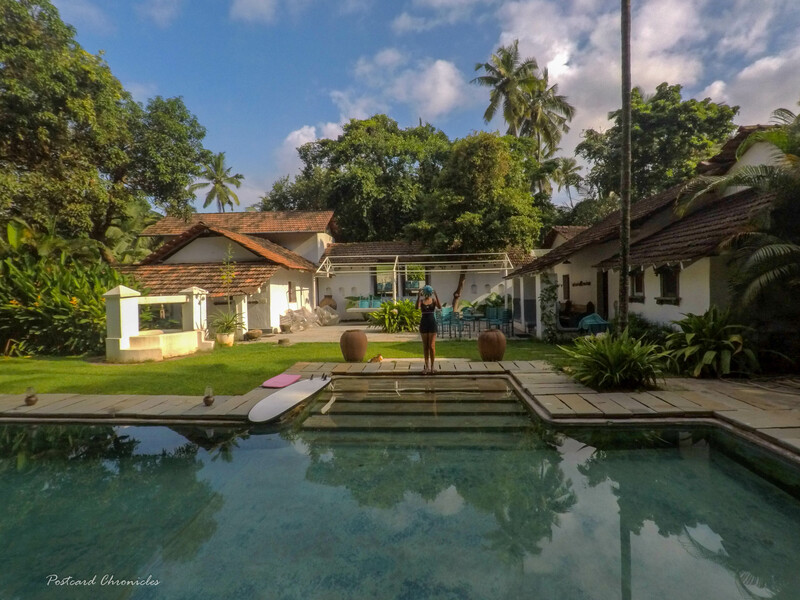 Vivenda dos Palhacos is one such beautifully restored 100-year-old Hindu Portuguese villa that sits quietly in the bylanes of Majorda in South Goa. With its narrow village roads that snake through paddy fields and a village dotted with colourful Portuguese homes, Vivenda dos Palhacos is the postcard representation of a life and time that was slower and simpler. This beautiful property is the creation of brother-and-sister duo Simon and Charlotte Hayward, who are the fourth generation in their family to be brought up in India. Their British grandfather founded the Haywards brand of liquor (these days famous for its iconic Haywards 5000 beer) near Calcutta in the early 1900s, while their father was a leader in the British business community in India. I absolutely loved my mornings in this house with its magical setting on the front pouch and waking up to the village life, the wind whispering to the trees with the occasional whistle of the train. Even time takes a break at this place and so will you. Spread over the main buildings are 6 spacious double bedrooms, all with ensuite bathrooms, plus a self-contained cottage and a tented room in the grounds. All are full of dappled charm, cross-cultural history and convivial peace. Each room is decorated with antique, colonial furniture keeping with the character of the house. Four-poster beds, large wardrobes, stainless steel ‘pot’ lamps and art make the rooms an inviting space to lounge in. The verandah has comfortable chairs to spend time in, including a barber’s chair which looks totally at home in that setting. If there’s one thing that defines Vivenda dos Palhacos, it’s the lively Lorry Back Bar. When you take a closer look at the bar, you’ll notice that it’s handmade from the back of a truck! The colourful lorry back bar with all possible liquor bottles shine even during the day time. The bar is stocked with a fine selection of alcohol, including the impossible-to-miss bottles of “family produce” (Haywards 5000 beer) lined up. There is also a small shop in shop set-up inside the property, majorly a collection of handpicked dresses, hats and jewellery by Charlotte. Each room is unique and meaningfully named after a place in India (Tamil Nadu and West Bengal) where the Haywards lived. I stayed in the fully-plumbed luxury tent, called Champara, which is fitted out with family camping furniture. The perks of staying in the tent is it comes with its own garden and entrance by the pool. Oh yes! The place has a fresh Ozone pool lined with a number of wooden sunloungers to unwind and relax. One of the best things about Vivenda dos Palhacos apart from their fresh ozone pool and 3 friendly dogs is their concept of communal dining. Since Vivenda dos Palhacos is an intimate property, you’ll bump into a lot of other guests. What better way to get to know them than at dinner! The evening communal “dinner parties”, where guests eat together with the host at the long wooden dining table, have become rather infamous. While staying there, I met a diverse variety of people from Germany, Australia, and England. The professionally-run kitchen serves up elaborate three course dinners, with the menu changing daily. The complimentary breakfast is equally satisfying. It includes warm Pau (traditional Portuguese bread rolls) eggs, fresh fruits and juices, marmalade, the finest tea from Darjeeling, and coffee from south India. -The graceful 12m Grecian pool is what stole my heart in the first place. It is an absolute pleasure to take a dip in the fresh ozone pool. –Gigolo, Kitten and Totty’s love will melt your heart. What more can a dog lover ask for! -Cozy reading nooks around the property. Vivenda dos Palhacos is a book lovers’ paradise, you can select a book from their enormous book collection, that is stocked up in cabinets across all rooms and sequester yourself in a corner with your book. -The location of the property which is just a stone’s throw away from the long talcum powder beach of Utorda. -The heart-warming host Charlotte makes sure every guest staying in Vivenda dos Palhacos feels at home. -The colourful lorry back bar where I spent my late mornings sipping a drink while glancing the newspaper. -The entrance gate of the Vivenda dos Palhacos which adds a rustic charm to the entire property. May be that’s why I ended up doing a sketch of it in my drawing book. Vivenda dos Palhacos is the perfect place to escape the hordes of tourists who throng to Goa, experience village life, enjoy lively conversations, take a break by the pool or read a book or two in its beautifully restored rooms complete with colonial touches and a generous dash of family history. This place is sure to stay in your memory for a long run. Add this charm to your staycation list next time!